BEFORE: When it comes to documentaries on food, you can’t get much better than Morgan Spurlock’s Super Size Me. From what I know, Food, Inc. will be looking at similar issues but on a much broader scale than just McDonald’s. And without the major health risk that Spurlock put himself through. AFTER: For years now, it’s been pretty obvious that the food we all eat is not healthy whatsoever. Even the healthy food isn’t all that healthy. Everything is doused in so many chemicals (pesticides, herbicides, growth hormones) that the food is no longer natural; it’s manufactured. Food, Inc. interviews many professionals in the food and farming industries to make the definitive, go-to source for all things food. There is a clear side the filmmakers want you to take; that the multi-national corporations control the entire industry and they are, knowingly, making unhealthy and sometimes deadly food. But the filmmakers do interview members on the other side of the argument (the ones that would participate anyway; most declined to speak). Their reasoning is that in order to feed the massive surge in world population, these new scientific and technological methods are necessary to meet demand. Super Size Me was a chance to see and end result. 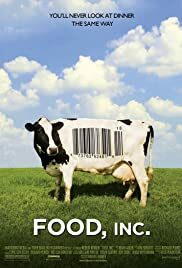 “Wow, look how bad eating McDonald’s everyday is for you.” What Food, Inc. accomplished was making a more informative documentary that dug deep into the where/how parts of the process. Where does everything come from and how have regulations overlooked so many important health aspects of manufacturing food. As a result, Food, Inc. is more effective at showing why you shouldn’t buy a lot of the big name food brands as opposed to locally-grown, organic foods. Maybe if I watch it a couple more times or another equally powerful documentary comes out in a few years I’ll actually change what food I eat. But for now, I cannot see myself giving up a wonderful bacon cheeseburger with a heaping pile of greasy fries for a healthier, yet less delicious, meal.